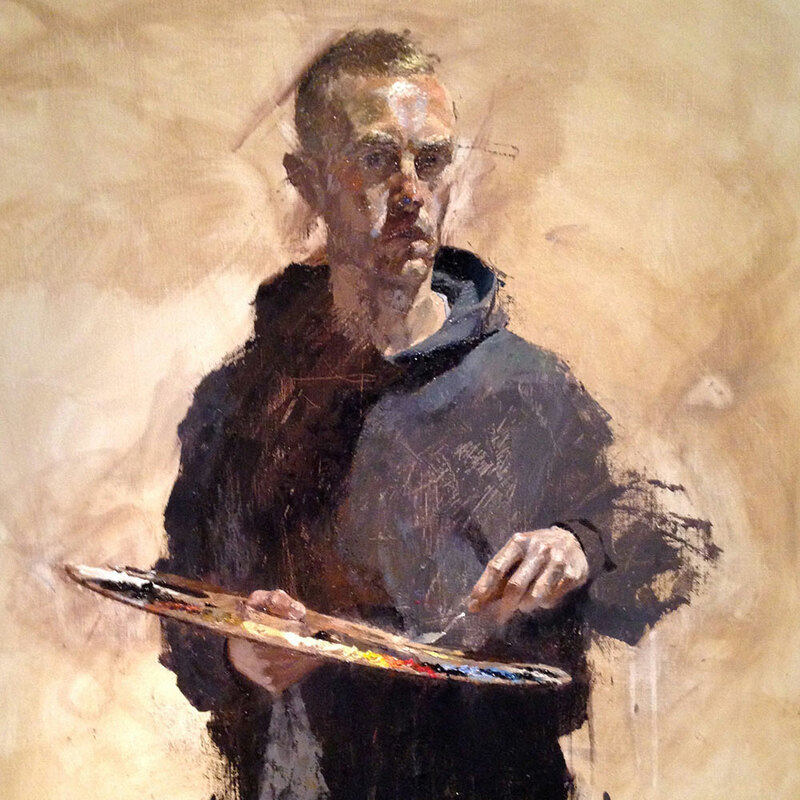 Benjamin Hope is a London-based artist who paints from life. 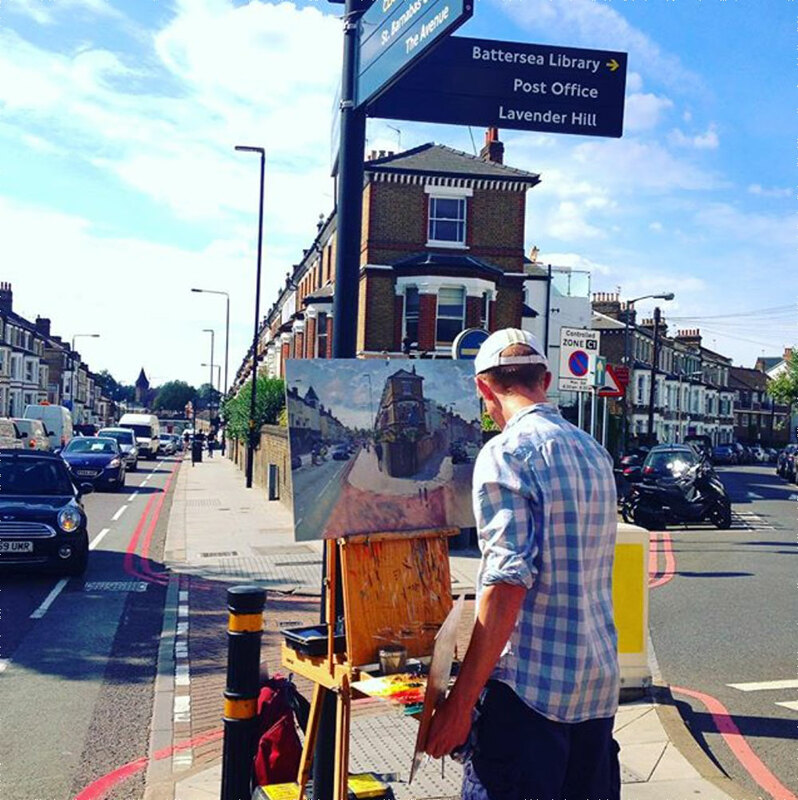 You can find him in various parts of London and the UK painting complex street scenes. 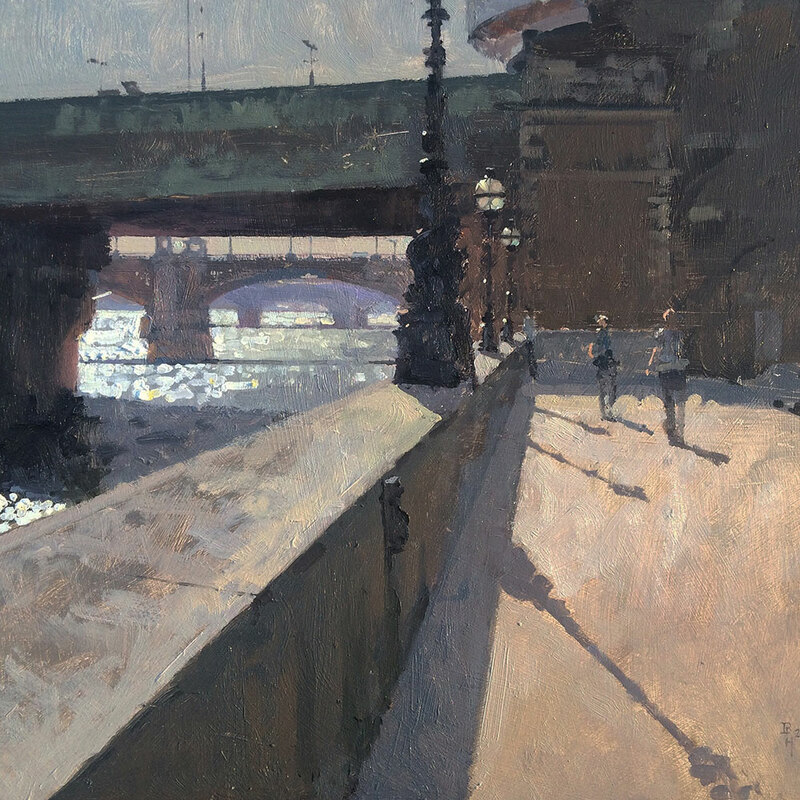 In addition to his plein air cityscapes, he paints portraits and still life, all directly from the subject. In November 2015 he had his first solo exhibition in London and his next will be in 2017. 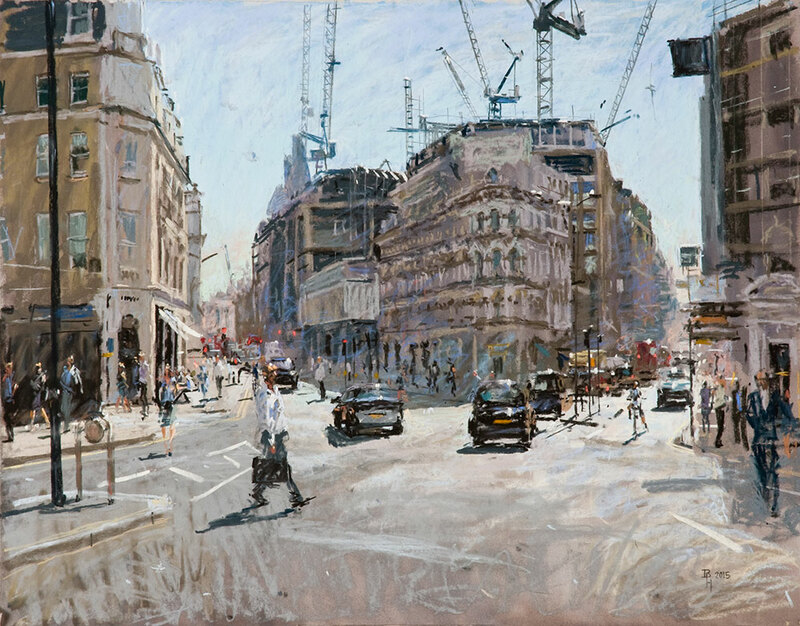 Benjamin Hope was awarded the Jackson’s Prize in 2014 at the United Society of Artists Open Exhibition at The Gallery, Cork Street, London. You can see the winning painting in this earlier announcement on the Jackson’s Blog. He has been awarded numerous prizes in the last few years and been short-listed for many more. I asked Benjamin some questions about his painting practice and ideas. Benjamin Hope: My mother is a painter as was my grandfather on my Dad’s side and some of my cousins are very creative. So art and painting were all around me from the start, and even at school I basically knew that I would eventually make it into a career. I took A-level art and was lucky to have a very good teacher, called Wendy Skinner Smith, who wasn’t afraid to teach proper drawing and criticise work. Apart from that though, I have no formal training. I have other interests that I decided to take seriously before switching to fine art. I read Mathematics and Physics at Warwick University before the infamous Part III Mathematics at Cambridge and then finally a PhD which was basically theoretical solid-state physics. My PhD wasn’t very good partly because, by that point, I was itching to paint. The time I had spent at university spanned 12 years and I only really did any painting during one month of each undergraduate summer break and during a year out after Warwick. After my PhD I spent a further three years working as a “quant” for an investment bank with the sole aim of financially kick-starting my art career. In 2011 I walked out and I’ve been painting full time ever since. Benjamin Hope at work on Battersea Rise, Clapham. Julie: How would you describe your practice? But the common thread is that I almost always work from life, directly from the subject no matter what that subject is. I say “almost always” because I am just starting to develop larger pieces that are based on smaller studies rather than being directly from the subject. Even then I don’t work from photographs. I cut my teeth as a still life realist spending hundreds of hours painting increasingly challenging objects in my studio / bedroom. 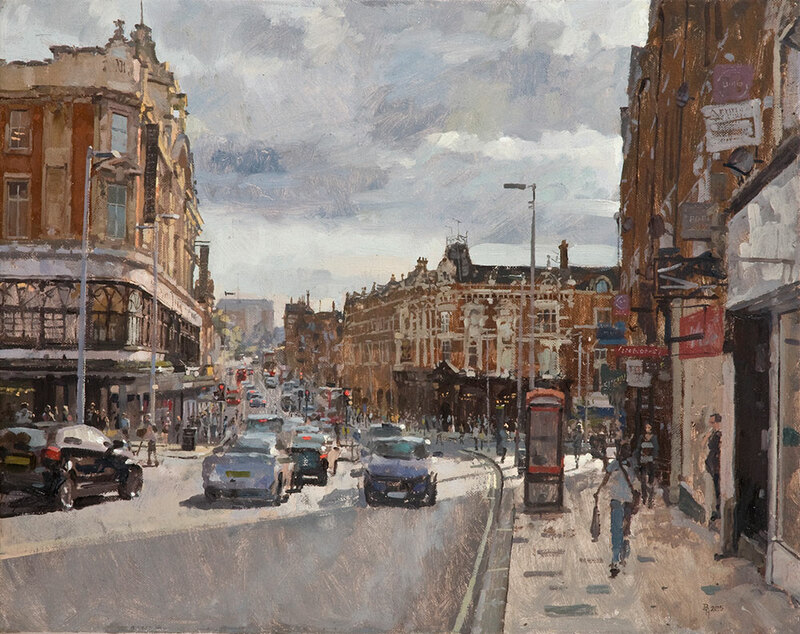 However, most of my work over the last couple of years has been on the street, painting en plein air mainly in London but also various other places like Oxford and Cambridge. 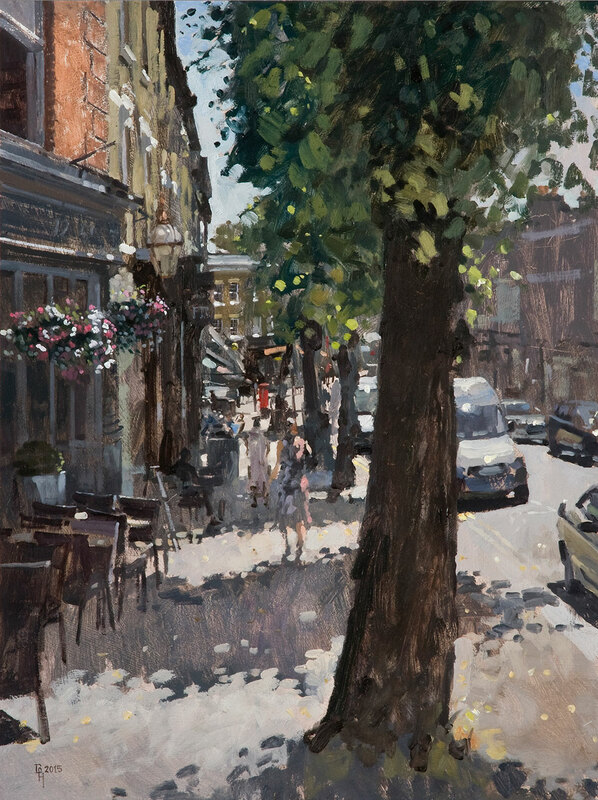 As any plein air painter will tell you, once you’re over the initial fear of working in public, it quickly becomes an addictive and exhilarating way of working. I haven’t left the studio completely. I still enjoy still life and I have a lot of ideas to pursue but I can only do one or two ambitious ones each year because they take so long and drive me slightly crazy. I also love portraiture but again don’t have time to do as much as I’d like. I am developing a palette knife approach to portraits, which is quite distinct from my other work. I almost always work in oil but a couple of years ago I started using pastels and charcoal too. 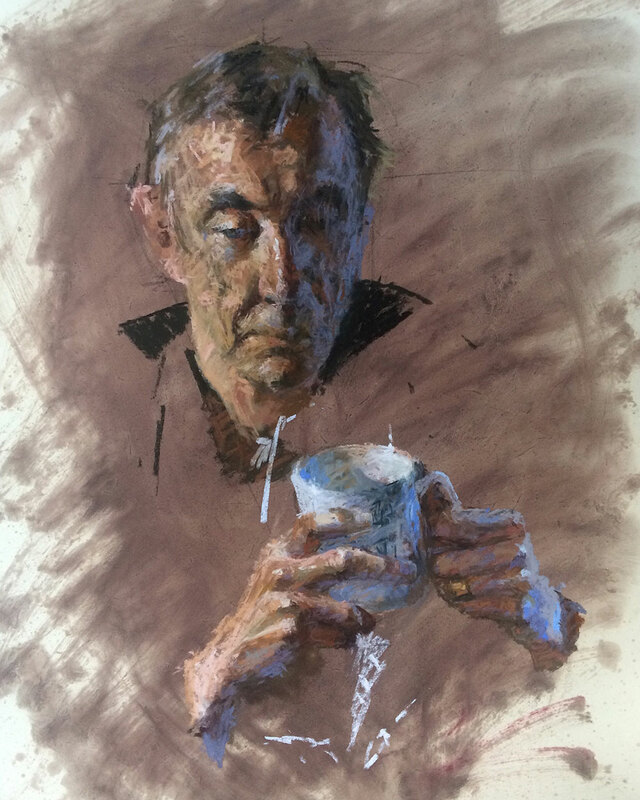 Pastels (the fat soft ones) are particularly fun to use outdoors when trying to capture fleeting light effects since you can be even quicker than oils and their bluntness forces you to be more of an impressionist – this is ideal for someone like me who can be a detail junkie. Julie: Your work is divided between cityscape, portraiture, and still life. To me it is natural for an artist to be interested in all the world around him, but some people think an artist should have a more narrow focus. Do you experience that? Benjamin Hope: Yes I’ve had that opinion expressed once or twice but I don’t understand it. Perhaps galleries find marketing narrowly focussed work easier. One lifetime is about 1000 months, which is terrifyingly short but it’s not so short that you can’t explore an awful lot of ideas during those months. In my opinion, the risk of spreading yourself too thin and not fulfilling your potential in one genre is outweighed by the cross-fertilization whereby one way of painting and seeing informs the others. Julie: Some of your paintings are quite small. Why are you interested in that intimate scale? Benjamin Hope: Actually I don’t have a particular interest in small paintings. I like all sizes. Small panels are lighter so there is a slight bias towards those scales when travelling to work outdoors. 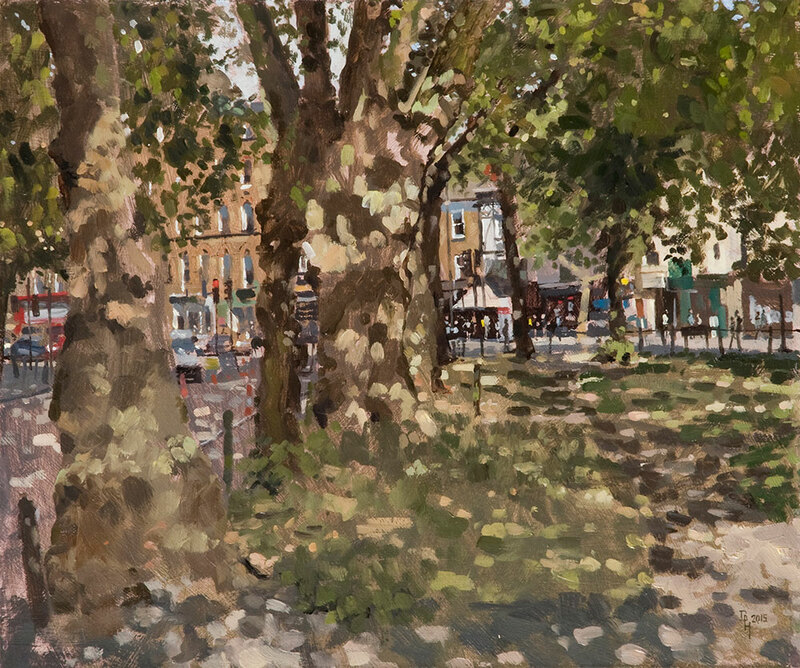 Also speed is of the essence outdoors and smaller paintings can be quicker, but not always – some of my 12 x 10 “ plein air pieces can take over 5 sessions to complete. No the main reason my outdoor work began small was that I was intimidated – it was daunting enough to set up an easel outside for the first time in 2013 without attempting a massive canvas. I am much less inhibited now and I’m starting to paint much larger outdoors. Painting fairly small indoors reflects a much more frustrating problem: property prices! I’ve only ever had small spaces in which to work. You can rent decent sized studios but I’m someone who has to live where they work and property in London with space for a large studio – by which I mean a really big room with tall ceilings and big north-facing windows – is simply unaffordable these days. Actually I might be able to solve this problem too so I am tentatively excited about soon being able to paint much larger studio-based pieces. Julie: I am always interested in materials. Most of your work is in oil on stretched canvas, canvas panel or wood panel. Do you have any favourite paints, brushes or surfaces? What is your preferred solvent or medium? 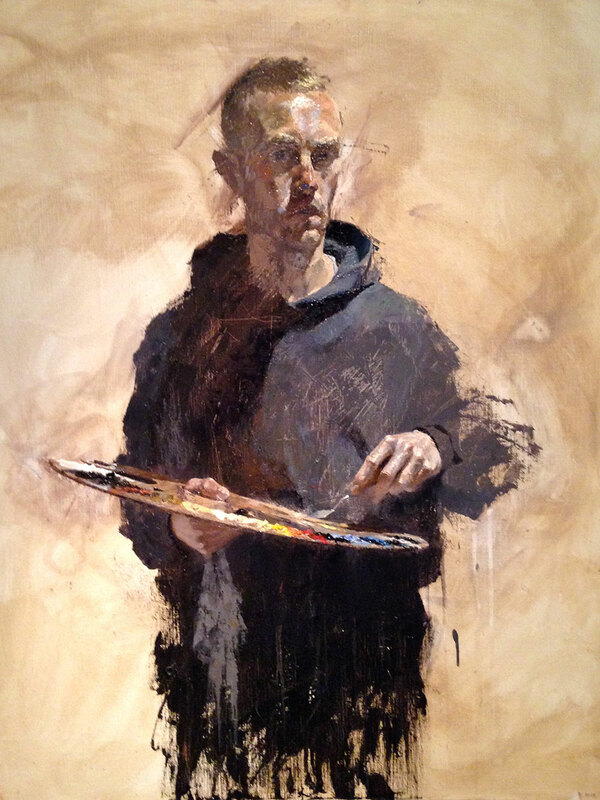 Benjamin Hope: For oils I use a combination of Michael Harding, Old Holland, and Winsor & Newton. Once I’m accustomed to a particular brand’s version of a colour, I am loathed to switch. Most of my outdoor work is on MDF coated with several layers of an acrylic gesso primer although I do use stretched canvases for larger pieces and I use an ultra fine canvas for my still life work. Most of my outdoor brushes are cheap – I get through a lot – or hand-me-downs from my still life work. Despite being paranoid about the toxicity, I plough on using distilled turpentine and I use several mediums: Roberson’s glaze medium, Liquin, Linseed oil, LUKAS #5. I use all these but I couldn’t begin to tell you how–the only way to use them effectively is to experiment. When it comes to pastels, nothing beats Unison in my opinion. Julie: How would you describe a good day in the studio? Benjamin Hope: 12 hours of concentration with few breaks except for a run and some food. I like to rise early (5am) but I also love working into the night with the radio on. Julie: In the last 2 years you have won many prizes and been short-listed for even more. Has being a prize-winning artist provided any new opportunities? Benjamin Hope: Possibly. It can only strengthen your position when it comes to things like gallery representation. Also, most artists have a side that is riddled with self-doubt. I certainly do. It is surely important to have self-doubt and be your own worst critic but it mustn’t get the better of you. Perhaps the most important thing about doing well in competitions and exhibitions – that people tend not to admit – is that it constrains the self doubter for a while and that in itself is an opportunity. That said, however, I try not to place too much emphasis on competitions. I don’t obsess over who the judges are and I rarely paint pieces specifically for a competition. I would much rather paint what hooks me than what I think might hook the judges. So I have various deadlines in my diary and just enter the most appropriate pieces I have on deadline day. 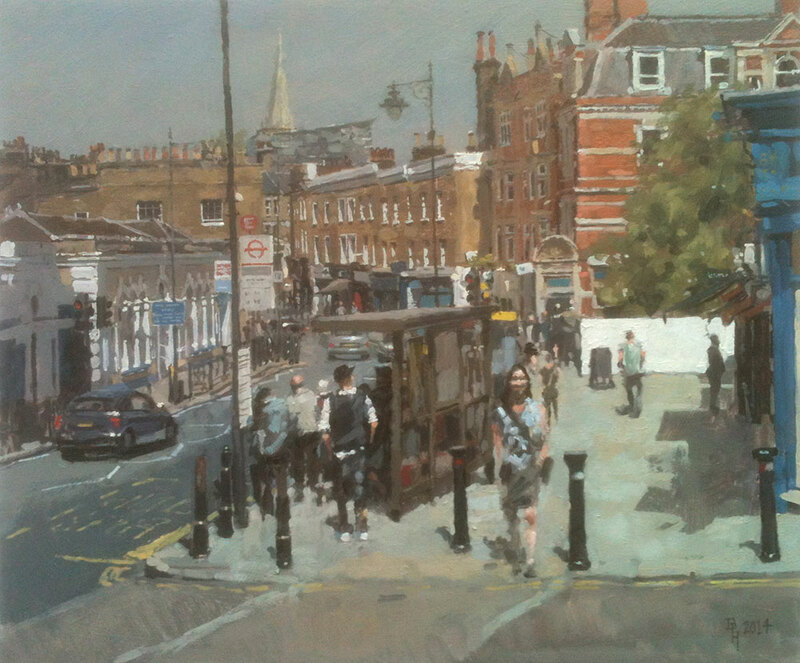 Julie: You are a member of two art societies: Oxford Art Society and Blackheath Art Society. What has your experience been as a member? Benjamin Hope: Being invited to become a member of the OAS was a memorable event back when I was 22. It was the kind of stamp of approval I needed at that stage. My Mum is a member now too. I try to enter their members’ show each year and the same with BAS. It’s nice being connected to a community of artists. Julie: What is your favourite artwork that you have ever done? Benjamin Hope: Difficult one. It would have to be a painting in which I achieved exactly what I was aiming at and made some leap forward or conquered something that had previously defeated me. 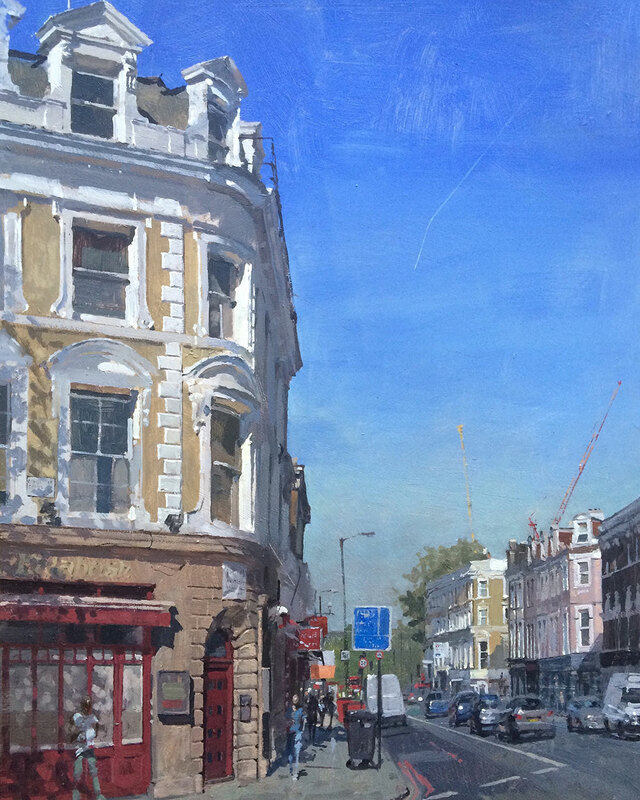 My current favourite is Clapham Common East Corner. It only took two sessions and I finally nailed greens. Greens are hard. Julie: Who/what are your influences? Benjamin Hope: Athletes. I at least tried to be a pretty serious runner at school and university (and I still try when my tendons allow) and down the years I have been lucky enough to train with people who went on to be Olympians. There’s a banterous no-nonsense work ethic in athletics that is effective in any pursuit. I first encountered it when I joined an athletics club age 11 and it helped me see what could be achieved when huge amounts of hard work are sustained over a long period. Athletics also taught me how to deal with disappointment and periods of bad form. 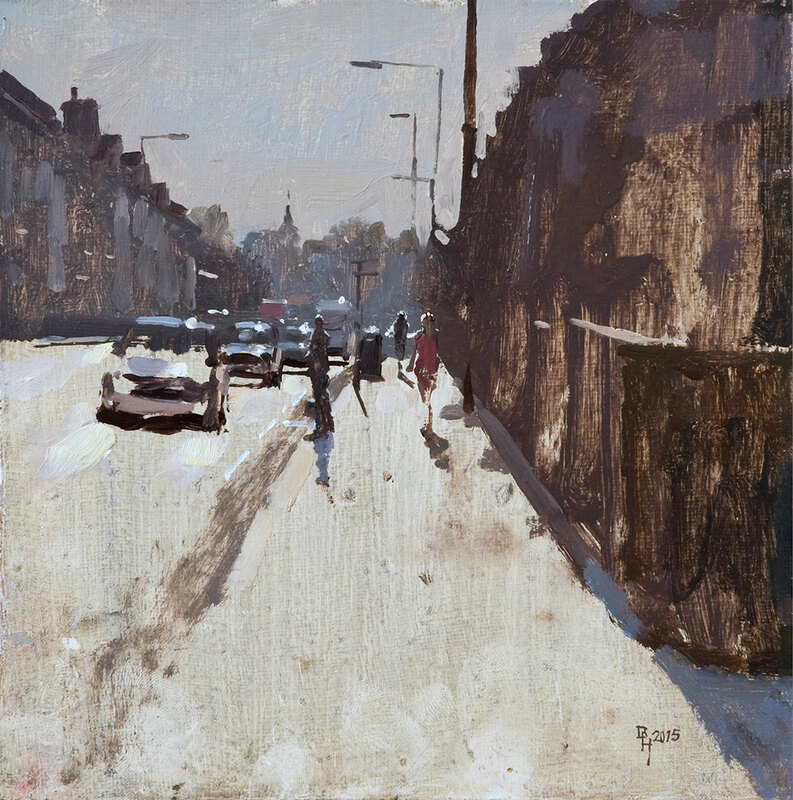 Ken Howard draws an analogy between athletes and artists and I think he’s right. More specifically in the realm of painting, early on I was influenced and fascinated by the art in film production design and special effects, back when there was a lot less CGI. And the annual festival, Art in Action, had a huge impact. I used to go every year and watch the artists at work in the painting tent. Benjamin Hope: Ken Howard, Peter Brown, Tom Coates, Andrew Gifford. These are the artists that I have found most compelling over the years. They have changed the way I see and paint. Julie: What is coming up next for you and where can we see more of your art in the flesh and on-line?